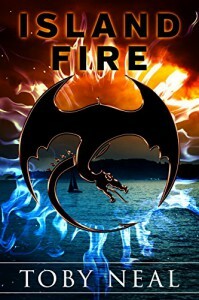 Island Fire was an exceedingly well paced adventure with a light supernatural element and fully fleshed out main and supporting characters. The main points of view switch between Bea and her brother Sam, the teenage children of an alcoholic father on the island of Lanai, and Nick, a teenage pickpocket headed to Maui to live with his grandparents. Their worlds collide in a very LOST-y kind of way, with all the technology has been fried and they must rely on natural instincts and survival skills in order to set their lives right again. Toby Neal captures the essence of being a teenager in both Bea and Sam very well, as well as sibling relationships and the complicated and warring feelings toward an abusive father. This story seems more like their story, though, with Nick more so as a supporting character who gets some time to shine occasionally. This isn't necessarily a bad thing, since Bea is the obvious protagonist in the novel. My only real complaint would be not finding out why and how the technology ended up dying out on Lanai, as well as on surrounding islands. I would have liked to have had a series of these books, maybe, with Bea and Sam being apart of some kind of huge cover-up or being "chosen ones" that must save the world from a supernatural element bent on destroying it. That would have upped the adventure and supernatural/thriller/suspense element for me, but it's also okay without it. It's all in all a nice coming of age story in a survival setting.